Although I am writing this on a cold, dreary Friday we did actually have a flash on some warm weather this week. It was lovely to go outside without layers of clothing and winter coats and Lucas was very happy to potter in and out of the patio doors and play in the garden. Everything seems better in the sunshine! 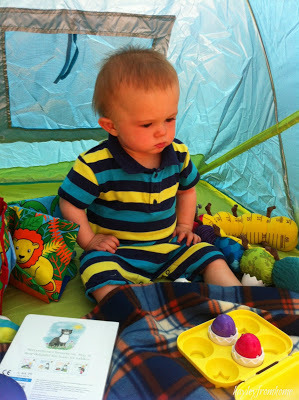 Last year I remember a similar warm spell in May when Lucas was around 8 months old; he wasn’t quite as happy about the heat then but we did set up a little sun shade tent for him in the garden. 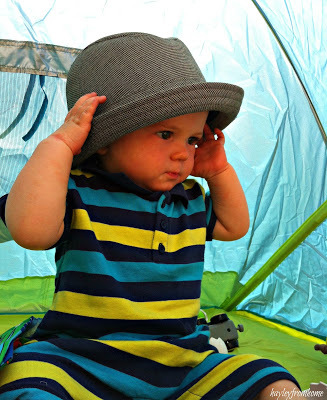 He sat out with us for quite a while, trying to keep cool and trying on Daddy’s hat. It was a lovely lazy afternoon spent with my little family. When we lived in our old house I wasn’t as far from my Nana and we went to spend the day with her every week. This was a life-saver for me as we were quite isolated where we used to live. In the sunny spell we went for lovely walks in the sunshine and sat in her garden and played with our sun hats on. 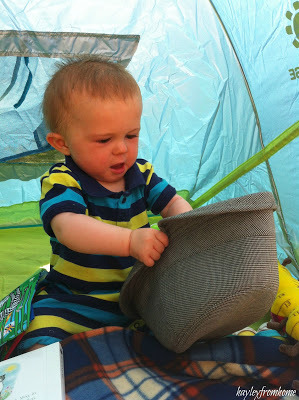 It’s all so different this year; he will let me put sun cream on him but keeping a hat on his head is quite an ordeal. Last year we could sit him in a spot and he would mostly stay there; this year we chase him all over the garden and he loves to go barefoot. I find myself chasing him with a sandal in one hand while he chuckles and runs away. Last year I was starting to see him change and we were reaching that stage that was getting a bit easier. Being out in the sun this year has been even more fun and hopefully we’ll get some more warm weather to enjoy! That middle bit when they start to find their feet and just want to keep on going in definitely a work out for us Mums. I prefer to lie in the sunshine LOL. Lovely pictures. Let’s hope the weather perks up! Me too, sometimes I just get settled in the sun and spot him trying to eat soil…not quite a relaxing time!